The sibling relationship lasts longer than all other relationships. The sibling relationship will last longer than the parent child relationship and longer than the partner relationship as well. 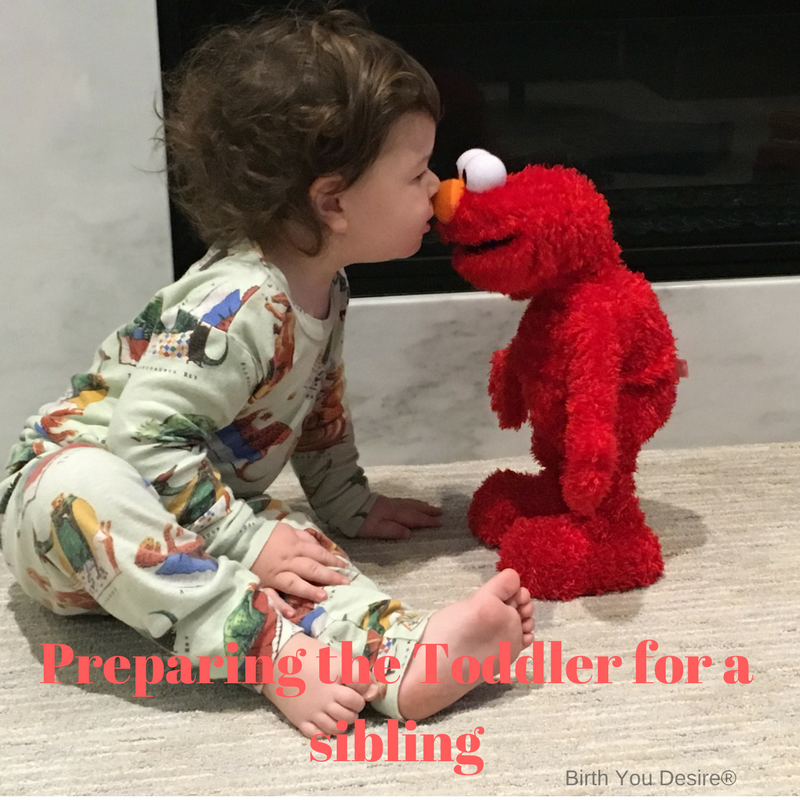 So preparing your toddler for a sibling is critical for their long term relationship. Their relationship can be strong, uninhibited, and intimate. No two sibling relationships are the same as each relationship and each individual has their own characteristics. So starting in pregnancy it is critical to get your toddler prepared to be a big brother or a big sister. When parents only have one ‘baby’ to take care of it is easy to make them the center of your attention. You can pick them up, cater to their needs, and accommodate to their schedules. This gets complicated when baby #2 arrives. Depending on the toddlers age they maybe extremely mobile and able to be self reliant in many ways. In other cases, you may still need to hold their hand walking to the car or even still carrying them as they are escape artists. To avoid issues like needing to carry two kids to the car simultaneously I have some suggestions for getting your toddler up to speed. Explain to your toddler that mommy’ back hurts’ and encourage the toddler to climb into chairs, cars, and bed themselves. Take turns putting your child to bed so that if the baby needs to nurse at bedtime, then daddy or grandma can get baby to sleep. Take turns bathing the child (see above). Designate new one-on-one times with the toddler. Instead of doing the bath, maybe mommy can read the book after the bath. Which is something she can do with a newborn in her lap too. Prepare the toddler to share your arms and your lap. As the due date approaches practice carrying a teddy bear around or placing the teddy bear in the infant car seat so the toddler adjusts a bit smoother. Becoming a big brother or big sister is a BIG deal! The more excitement you can create around it the more excited they will be to meet and assist with the newborn. Here are some simple ways to orient your ‘baby’ into becoming a ‘toddler’. Start calling child #1 by their name and not ‘baby’. It is common for the toddler to get jealous of the baby and to revert behaviors in order to get more attention as they self identify as the ‘baby’. Visit families or events where there will be siblings. Talk abut how their friend Claire is now a big sister and that baby Will is here. Read books on becoming a big brother or big sister. Take a siblings class if one is offered in your area. Talk about how ‘big boys’ eat at the dinner table and ‘baby’s need milk’. Or about how ‘big boys’ wear underwear and ‘baby’s’ wear diapers if appropriate. Incorporate the toddler in packing the baby’s first outfit or picking a name (between your two favorites). Introducing the siblings does not have to be nerve racking. The first step is to be prepared for the unexpected and then the second step is to acknowledge their feelings. Visit the birth place at a meal time and have them bring birthday cupcakes or a pizza for the first family meal. This helps to occupy the child as well as create that family environment. Have a present form the baby to the toddler. And have that present for the first visit (see above). Some families choose to have the toddler to pick a toy or stuffed animal to bring to the baby as a way to establish sharing. Try to keep your toddler on their existing schedule. They need their alone time too in school or daycare. Oftentimes, changing their routines will make them anxious, confused, and more likely to act out. Remember however the first meeting goes, you need to acknowledge your toddlers feelings even if they were not what was expected or hoped for. If they act out then you have a toy and a meal to distract them. Part 2- Building a Family will be released next week.